I had my first post-op appointment. Doc says things look good. In fact, from the size of the incisions, it looks as though I’d just received a few shallow scratches. In reality, there was a whole lot of shaving and bone spur removal going on. Turns out that I also had a partial rotator cuff tear. No wonder it hurt like hell to knit, with all that stuff in the way and the shoulder joint partially dislodged at times from the socket. 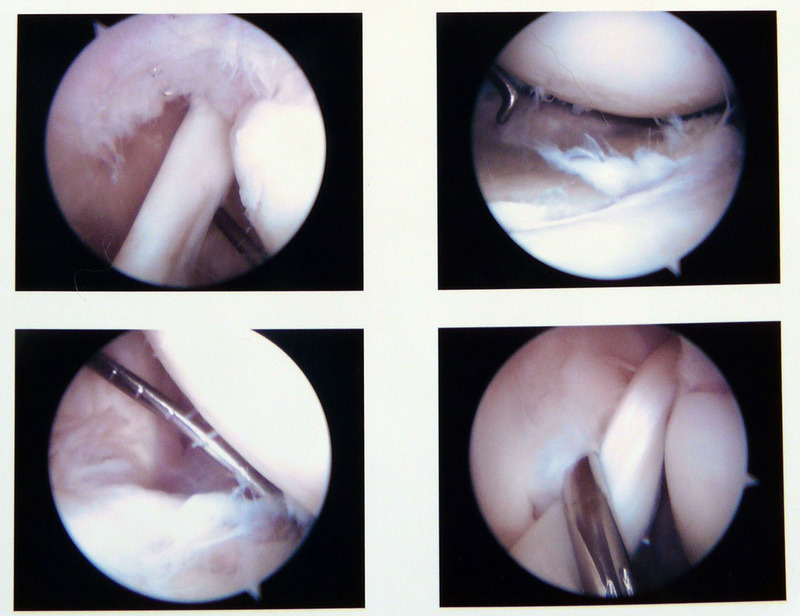 For the medically curious, click this link to see an actual “inside my shoulder” picture. Top left picture is my collar bone. Top right is the frayed socket. Others should move on. In knitting news, I think I love these new Signature Circulars. Not only are they a lovely bright blue, the stiletto points work so well. Not so sharp that they poke your finger mind you, but just right for the “grab and lift” you need for knitting nice, even stitches – even as you nod off from the pain meds and audio books. I’m peeved about sleeping through the first few chapters of “Pride and Prejudice and Zombies: Dawn of the Dreadfuls” as I will have to start from the beginning. 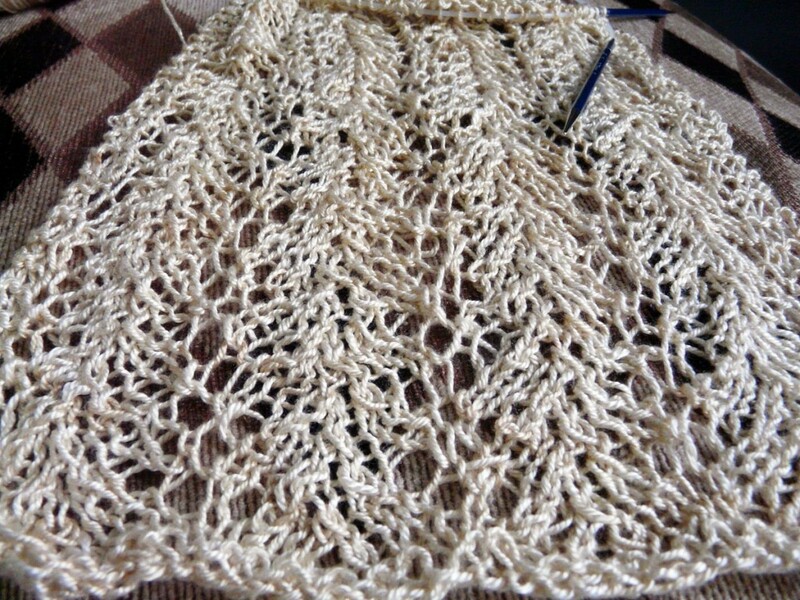 Still, I have made progress on Nicole Hindes’ Strangling Vine Scarf (Ravelry). The jury is out on the impact Phase Two (physical therapy) will have on my speed and skill at keeping the knit going. I am, however, a compliant patient with an interest in continued improvement. So yeah. I’m going to PT. 6 comments to How do you mend a broken knitter? I don’t own a television and knitting to audiobooks is my favorite way to spend time. I listen to them as I drift off to sleep at night. It’s like having someone read me to sleep. Right now I’m listening to Shogun by James Clavell. I’m glad you’re going to PT. It’ll help you get your range of motion back and make sure things are working. Wishing you all the best as you heal! It sounds like quite the procedure. Yikes! Yay that you are healing so well and knitting along quite handily there! I am so glad that you are healing well and that the doctor was able to fix your shoulder “innards”! I’ll continue to pray that healing, PT, AND your lovely knitting go well! Glad you are healing well! I’m so glad to hear things are progressing nicely! Enjoy the rest, even if you do have to re-listen to a few chapters!! !